Back when CBS first picked up Supergirl, pretty much everyone but CBS itself assumed that the show would eventually find some way to crossover with The CW’s Arrow and The Flash. All of the shows are executive produced by Greg Berlanti and Andrew Kreisberg, and The CW has already proven that big superhero crossover episodes are like ratings (and fan service) dynamite. CBS was reportedly hesitant to even consider a crossover initially, but a rumor came out back in November that the network was becoming more open to the idea as a possible way to boost Supergirl’s ratings and help guarantee it a second season. Now, according to Variety, the crossover is officially happening, and the Flash will be visiting Supergirl over on CBS later this season. The network hasn’t released any specific details about how the crossover will work yet, so that means there are a lot of nerdy questions that Flash and Supergirl fans will be able to ponder while they wait for this thing to air. For example, Superman exists on Supergirl, but—as far as anyone knows—he doesn’t exist on The Flash, so the two shows probably aren’t set in the same universe. The Flash has spent a lot of time this season establishing that there are alternate Earths, so is that how he’ll explain his appearance on Supergirl? Will Supergirl viewers be fine with the sudden revelation that their universe isn’t the only one? Or will Supergirl’s Flash simply be that universe’s version of him, and he won’t be tied to his CW storylines at all? Basically, however they justify this crossover, it will be ridiculously convoluted in the best possible way. 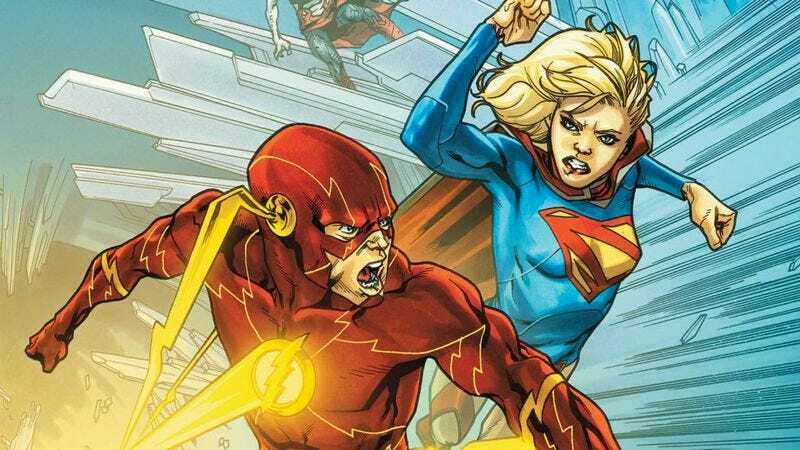 Supergirl’s crossover with The Flash will air on March 28 on CBS, and it will hopefully feature at least one high-speed race around the world.